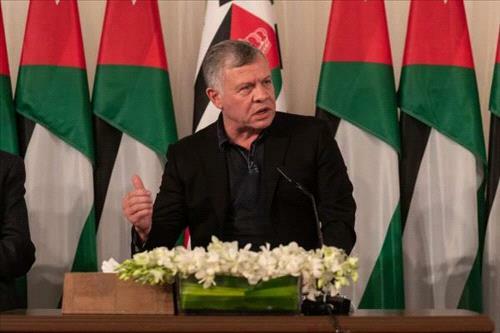 AMMONNEWS - "My position on Jerusalem is unwavering," His Majesty King Abdullah affirmed on Wednesday, noting that the Hashemite commitment to the holy city is clear, as Jordan has a historical duty towards Jerusalem and Islamic and Christian holy sites. "To me, Jerusalem is a red line, and all my people are with me," King Abdullah said. "No one can pressure Jordan on this matter, and the answer will be no. All Jordanians stand with me on Jerusalem. At the end of the day, Arabs and Muslims will stand with us as well," His Majesty said during a visit to Zarqa, where he met with representatives and key figures from the governorate. Commenting on those mentioning attempts to make Jordan an alternative homeland for the Palestinians, the King said: "To anyone who speaks about an alternative homeland, the answer is no". His Majesty also highlighted Jordan’s efforts to bolster joint Arab positions on mutual challenges, as well as the Kingdom’s work to promote Arab economic cooperation. During the meeting with representatives of Zarqa, the King recalled his military service in the governorate, noting that he is aware of the challenges its people face. Zarqa is also a key industrial city, His Majesty said, stressing the need to attract more investments to create job opportunities for youth. The King noted that the London Initiative Conference will help boost economic development, calling for setting out priorities to bring in Arab and foreign investors to launch their projects in Jordan, especially in Zarqa Governorate. His Majesty pointed to the important role of the private sector in identifying these priorities. The King also referred to environmental challenges in Zarqa, directing the government to form a taskforce to visit all areas suffering pollution and come up with solutions as soon as possible. "I know over a third of the schools here work double shifts, which affects students and teachers," His Majesty said, adding that funds allocated for decentralisation will be utilised to build new schools and address the issue of rented school buildings. The government will coordinate with the Royal Medical Services to improve health services in the governorate, the King noted. His Majesty told the attendees that a government team will visit Zarqa to identify development priorities, and the Royal Hashemite Court can provide support through a number of initiatives.